Tower Hill High School "Tigers"
Tower Hill (population 609) is located in south central Illinois. The town was platted in 1857 and is located on Illinois Route 16 in eastern Shelby County. For location sake Tower Hill is located about 40 miles southeast of Springfield and 30 miles due south of Decatur. The Mitchell Creek and a branch of Becks Creek flow through town. The Conrail Railroad is joined briefly in town by the Baltimore & Ohio Railroad. The village was first established in the 1840s and was originally known as Pilot Knob. The town later was named Westminster when the post office was established there in 1849. The town name was changed to Tower Hill due to its being a navigational landmark. The town was named by Simeon Ryder and P.C. Huggins in 1857. Information is needed on the history of the high school system in Tower Hill. The photo above was found on the "rootweb" website at http://www.rootsweb.com/~ilshelb2/towerhill/schools/towerhillschool.htm . It is known that the Tower Hill High School District was active for over 100 years! The school-aged children were able to attend all 12 years of schooling in Tower Hill for over a century. It was not until the turn of the century, in fact, that the challenges of time, money, and enrollment finally caught up to Tower Hill. The year was 2003 when the residents of the town voted to close the high school. The grade school is still active and serves kids in fifth grade for the Pana School system. The Tower Hill High School building now serves as the sixth grade building for the Pana school district. The high school-aged students of Tower Hill now attend Pana High School. 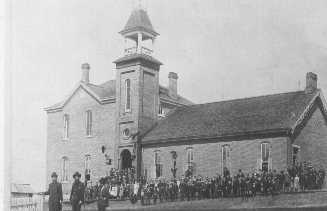 It is not known if the school pictured above is still standing. A photo of the most recent Tower Hill High School building is being sought. The Tower Hill High School Tigers were very competitive, though their small enrollment limited the number of sports they could offer. The boys competed in basketball, track, and probably baseball. The girls competed in volleyball, track, and probably basketball at one point. It is also possible that Tower Hill High entered into a co-op effort with nearby Pana or Shelbyville at some point before its closure. Conference affiliation and the records of someof the better teams are being sought. *Note: As of 2012 with the closing of Lovington High School, all of the schools in this conference are now closed or have gone through a change in their name. One male athlete carried the banner for the Tower Hill Tigers for many, many years. In the 1930s track & field was a one-class sport. Dale Dilley showed he belonged with the best of them. Taking on all comers, Dale won the IHSA State Championship in the 220 Yard Dash in 1939! His efforts resulted in a 10th place finish for the Tigers overall. Dale Dilley 220 Yard Dash STATE CHAMPION!! Highland Park, Mendota, Paris, Springfield HS all tied with 5 pts. also. The Lady Tigers had some real nice volleyball success in the 1980s. Coach Sharon (Christian) Rincker led the lady netters to an overall record of 114 - 106 during her ten seasons at the helm. This included five straight winning seasons. Unfortunately this is the only era of volleyball covered on the IHSA website. The Tower Hill Tigers had some good, competitive seasons on the hardwood court as well. The Tigers won two District Championships. There are only three seasons listed on the IHSA website regarding the boys basketball program. The last season listed is of the 2002-03 school year when the Tigers, coached by Travis Reider, finsihed the year with a 3 - 22 record. Jay R. Brown tells us the coach of the Tower Hill HS basketball program in the early 1950s was Bob Miller. Coach Miller went on to coach at Blue Mound-Boody High School from 1955 through 1965. He would later become Superintendent of Schools for Coles County. The exact seasons that Coach Miller was at Tower Hill High School are needed. Some basketball scores from the IHSA Tournament involving Tower Hill High School were located on a website titled "Illinois Postseason Basketball Scores." The scores we located are printed below. Unfortunately the records of other great Tower Hill teams are not available. Pawnee lost in semi-final round. "Tower Hill would have had the distinction of winning the longest boys basketball game in IHSA history (6 O/Ts), beating Lakewood High School 18-14 on November 8th, 1929. However, that record was short-lived as it was broken in the same season when Terre Haute, IN beat Casey in 7 O/Ts on February 1, 1930." Cowden lost in 2nd Rd. Beecher City won District title. Stewardson Strasburg won District title. 1972-73 through 1986-87 Postseason scores, records, and coaches' names needed. "I taught at Tower Hill HS the last year it existed, 2003. The top photo on your website is the HS building that was used as the last HS in Tower Hill. It is still standing and serves as the main building in the Pana grade school located there. There was talk they were going to use it as an alternative school or shop/trade building, but I don't know if that ever came to be. We were annexed in 03 by Pana and now all Tower Hill students attend Pana schools. The last year we were there we still had a girls volleyball team and a boys basketball team. All other athletes went to Pana to participate in other sports like FB, baseball, track, girls basketball, softball etc as we had a co-op in place with them. We were not very successful in either sport as we only had 43 enrolled total students on the first day of school in August of 2002. At one point in their history, Tower Hill offered football, basketball, baseball and track to the male athletes. Girls were able to compete in volleyball, basketball, track and maybe softball. There was while I was still there, a photo of one of their football teams in the trophy case. At one point I think they were still pretty competitive in baseball to. I left after 03, I taught social studies at Tower Hill HS (actually, I was THE social studies dept. :) ). I moved on to Shelbyville after. I drive by the old school every chance I get, but it's not very often since I'm now teaching in Clinton." "I played basketball for Tower Hill from '85-'86 to '88-'89. While my final two years were forgettable (0-23 in '87-'88 and 1-23 in '88-'89), I took pride in wearing the maroon & gold. That one win was a 48-38 defeat of Springfield Lutheran. We were more competitive during my first 2 years of high school. I don't recall our records but both years would have been .500, give or take. My most memorable game to watch was during the '85-'86 season. Macon scored late to take a 1 point lead and we were able to get a time out with :01 left on the clock. I believe it was Chuck Chesterman taking the ball out under the Macon basket and he threw a pass the length of the court to Pat Guiot. Pat beat the buzzer from the free throw line and the Tower Hill crowd stormed the court. A new gymnasium was built directly west of, and connected to, the main building around 1981. 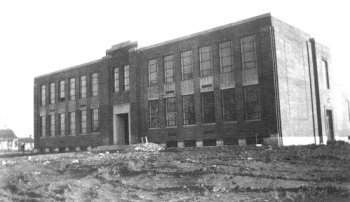 The picture at the top of the page is of the high school building that was built somewhere around 1930 and is still there today. After completion of that gym, Tower Hill finally had a facility large enough to host the Meridian Conference Tournament and did so for the 50th annual tournament. This would have been sometime between 1981 and 1984."